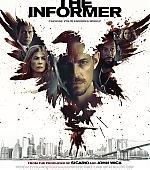 Check out the first official trailer, including a behind-the-scenes photo and a production still, for The Informer! The film was previously known as Three Seconds, and is set for a March 2019 release. VARIETY – Aviron Pictures has bought North American distribution rights to Andrea Di Stefano’s thriller “Three Seconds,” starring Joel Kinnaman, Rosamund Pike, Clive Owen, Common, and Ana de Armas.